My parents received some taro cake from the family friends we had dinner with on Saturday night. They got it from New Hwong Kok, a Chinese bakery in Milpitas. The bakery apparently only makes steamed taro cake for Chinese New Year. 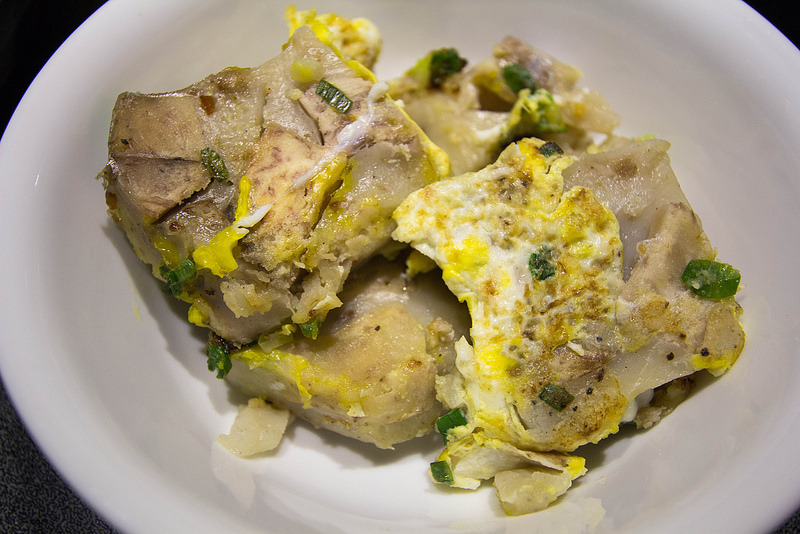 My dad pan fried slices of taro cake with green onion and egg, for dinner tonight! I usually make my own sauce to go with the taro cake, with Ajinimoto gyoza dipping sauce, sesame oil, and Sriracha or garlic chili sauce. A similar Cantonese dish is daikon cake, where daikon is used instead of taro. Whichever ingredient is used, the taro or daikon in the cake can be in chunky pieces, thin pieces, and/or in a paste with the rice flour. In the photo below, you can tell that the taro is in chunky pieces. Taro and daikon cakes are also popular to make and eat during Chinese New Year.